The Original Creative Edge Solar-5 Solar Panel 5000mAh Charger! Charge Anywhere - Plug it into the wall to charge and take with you - or - If you're in an emergency situation, utilize the solar panel feature to charge the internal battery of the SOLAR-5. Captures light from the sun efficiently to provide endless power to your devices! Note: When solar charging ensure the device is receiving unobstructed, direct sun for efficient charging. Highest Quality Materials - The best environmentally friendly silicone protects from rain, dirt, and shock/drops. It uses lithium polymer batteries with 5000 mAh. Equipped with over-charge protection system. Over 1000+ recharge lifecycle. Stylish design - Designed for all walks of life. From the rugged outdoorsman to the business professional. Compact design makes it comfortable in your hand and fit perfectly in your pocket. LED Indicator Lights - Easy to read Solar Charging indicator light to let you know that your charger is charging using solar energy. It has 4 power indicators (25%, 50%, 75%, 100%) so you know how much power is available. Compatibility - Compatible with most USB-Charged devices such as iPhone, iPad, iPod, Samsung phones, other Android mobile phones, cameras, Kindles etc. Great Customer Service - We are an America based company that provides excellent customer service. Our 1 year warranty ensures that you will not be disappointed with our product! Backed with a 1 year, No-Hassle, Free replacement Warranty! Please Note - The solar panel feature is designed for emergency use. This is due to the size of the solar panel limiting charge time. We recommend charging the SOLAR-5 using electricity. 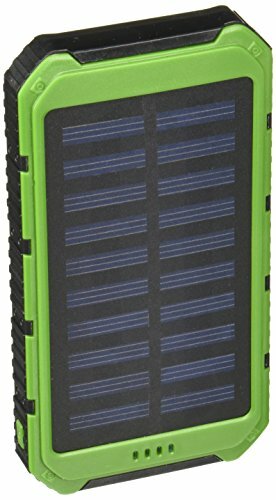 THE BEST OF ITS KIND - The Original Creative Edge Solar-5 Solar Panel 5000mAh charger transforms environmental friendly solar energy into power to charge the internal battery of the SOLAR-5. Your SOLAR-5 can be charged by being plugged into a wall outlet and used as a power bank while you're on the go! Solar charging isn't as fast as wall charging but it's a great way to charge your SOLAR-5 in an emergency situation. HIGH QUALITY MATERIALS - The exterior is made of silicone, allowing this device to be water, shock and dust resistant! It's rugged yet stylish. Perfect for hiking, sporting events, flights, camping, jobsites, etc. It's designed to be compact, lightweight, portable, and easily fit in the palm of your hand. You can even use the included hook to attach it to your bag! DUAL CHARGING PORTS - The 1.2W monocrystalline solar panel charges the built-in 5000mAh Lithium polymer battery. 2.1A output allows you to charge TWO devices at once! The right USB can reach 2.1 amps to charge devices that require higher amperage, like Samsung phones and tablets. The left port is one amp. When charging two devices simultaneously both USB ports are 1 amp. Battery can reliably be charged over 1000 times! NEVER BE WITHOUT A FLASHLIGHT- Tap the power button twice to turn on the emergency LED Flashlight which makes this device useful in the light and in the dark! It has 4 LED indicator lights to let you know how much power you have available. FREE ACCESSORIES - Package includes the Solar-5, USB to microUSB cable, microUSB to Apple Lightning adapter, and a carabiner. If you have any questions about this product by Creative Edge, contact us by completing and submitting the form below. If you are looking for a specif part number, please include it with your message.